MEDIA: Women are going under the knife to get rid of cankles the cosmetic way. In 2018, there aren’t many body parts exempt from insecurities that can’t be changed with a nip and a tuck. More of us are going to extreme lengths to improve our looks, with ear lobe reductions, knee lifts and armpit liposuction all on the up and up. Now, ankles – or ‘cankles’ – are the next body part we’re going under the knife to alter. Cankles, for the uninitiated, refers to the area where the calf meets the ankle and there is no real distinction between the two leg parts. And women with thicker calves and ankles are turning to liposculpture. “Small amounts of fat removal can change the shape of the ankle dramatically. 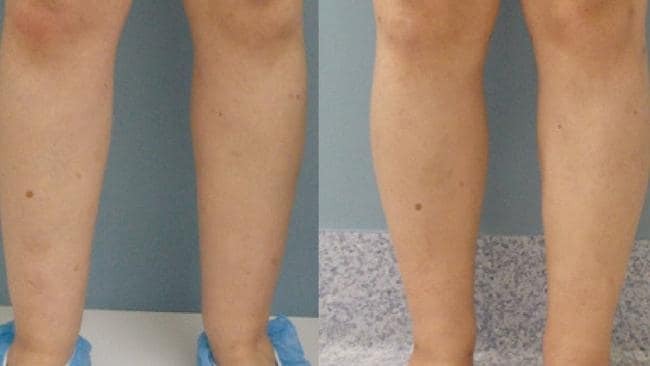 The aim is to make the leg appear finer and more symmetrical,” explains cosmetic surgeon Dr Meaghan Heckenberg of Sydney’s Be Sculptured clinic. Less invasive than conventional liposuction, it involves a local anaesthetic solution injected into the fatty tissue small horizontal incisions being made in the skin (about 3-5mm in length), then fine cannulas used to remove the fat, with the goal to reduce the bulk of the calf and make the lower leg look slender. Before and six weeks after surgery. Having performed over 700 liposculpture procedures since 2008, Heckenberg says the results of removing even a small amount can be dramatic. Although it doesn’t come cheap. Smaller ankles will set you back around $7200 (this includes the whole calf and ankle area) and recovery is tough. “A patient may not get final results until a year down the track. This is because this area is the most dependent area of the body and the body has to fight gravity for the reduction of swelling,” says Dr Heckenberg. Of course, make sure you find a surgeon who is certified by the The Australasian College of Cosmetic Surgery (this is easily done by checking their credentials via the ACCS website) Also, choose someone whose speciality is in your chosen surgery and then get clued up on exactly what you’re after before going in for the initial consultation.